Over the past couple of days I've been working on setting up a website, I'm pleased to say its now at a stage where it can go live. You can find it here cainscrimgeour.co.uk. 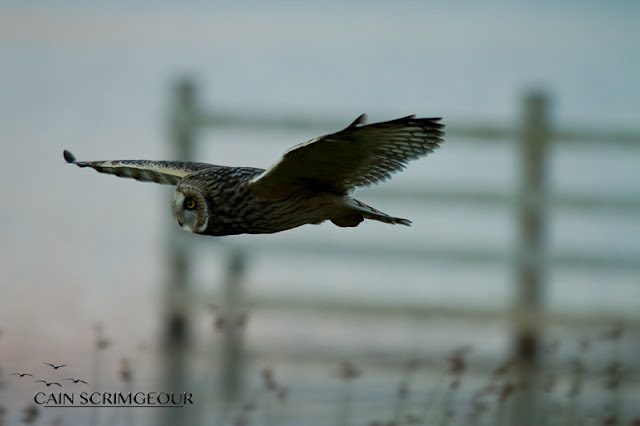 A quick half an hour tonight at Holywell was more than worth while, 3 Short-Eared Owls were hunting the main meadow. If you haven't been down to Holywell to see the SEOs yet I would highly recommend it, you don't need to travel any further than the public hide. I enjoyed views last week of the Shorties Cain until the local Corvids took exception and all but drove them off. Had thirty minutes with the Shortie at St Marys earlier before heading up to Holywell the same evening. They're great to watch aren't they? Just something about them. A nice close-up! Cool also that you have your own website. I'll Bookmark this.